With most smartphones sporting a touch-based screen interface, we’ve seen an abundance of music creating apps over the last few years, and whilst many of them are just novelty imitations, some try very hard to be taken seriously as music-creators. There aren’t many instruments bereft of some App Store / Android Market loving, and one can try the harp, piano, drums – even mix using turntables from the comfort of a smartphone or tablet device. Let’s not beat around the bush, though – the world’s favorite instrument is the guitar. The essential companion of every rock star, the guitar comes in numerous different forms – each with varying levels of difficulty. 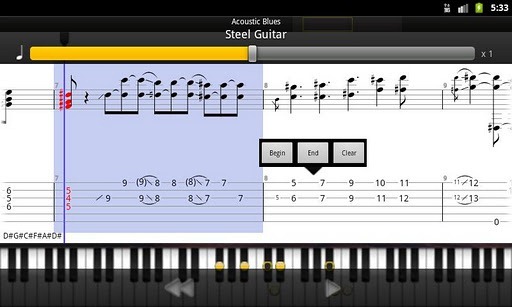 To help out, Arobas Music has created a great little app for Android users called Guitar Pro Tab Player. 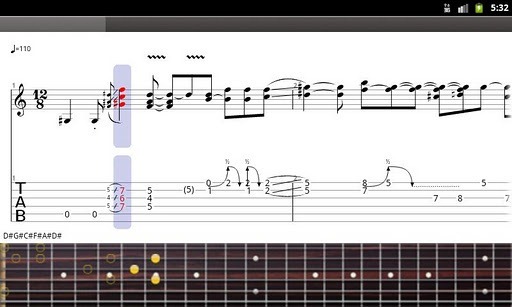 This mobile version is created by the same company behind the famous Guitar Pro tab-editing program for Windows, Mac and Linux, and is billed as the ideal companion for users to practice their favorite songs and share on-the-fly. Guitar or bass fretboard (for right- and left-handers), and virtual keyboard. The score display for Android tablets is not yet optimal, but the developers have promised a swift update to amend the issue. 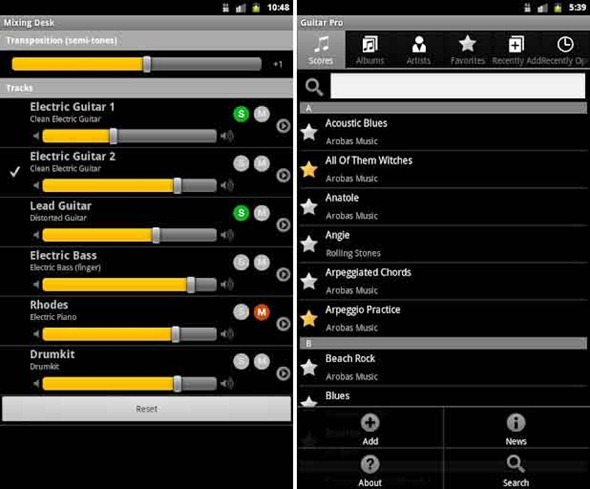 Guitar Pro Tab Player is available for Android phones running Android 2.2 Froyo and higher, and costs £3.39 over at the Android Market. Early reviews are relatively good, with an average of 3.4 out of 5 vote cast by the army of early adopters. Then again, some have complained that the app needs a little more work in places, so you may want to hold off for the promised updates before dipping into your wallet.